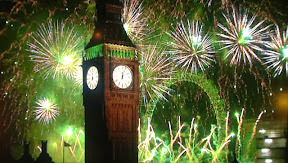 Bill's Blog: So what will the new year bring? 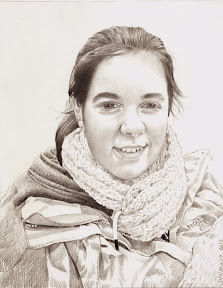 Hopefully happiness, interesting painting commissions, fun travel, lottery wins, and most of all good health with no more operations. On Christmas Day I picked up Val and drove through the floods to Marlow where we spent the day with Louisa and her family. 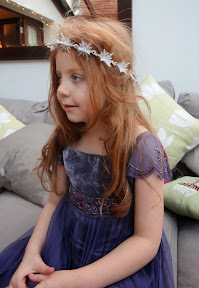 Here's Kate - she's still wearing the silver headband she wore for her performance on Christmas Eve. 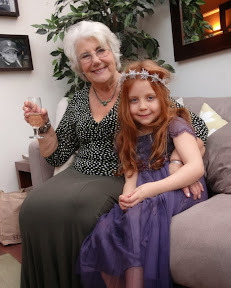 And here she is with grandma Val. 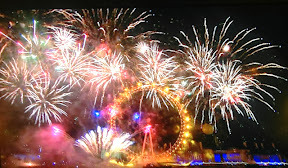 We had a lovely day with Louisa, Guy, Max and Kate. Great turkey dinner and special leeks for me without cheese sauce. She never forgets my strange eating habits. 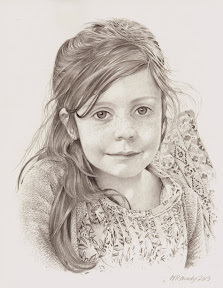 Now Christmas is over I can reveal the three pencil portrait Christmas presents I made of the children for Tim and Lynn and Louisa and Guy. In order - Kate, Ellie, and Charlotte. 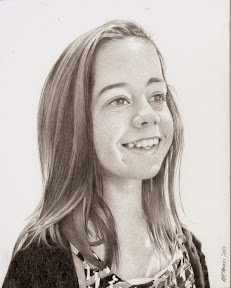 The day after Boxing Day my young friend drove me down to Suffolk to stay with her parents for a few days. The sun shone all the time we were there. 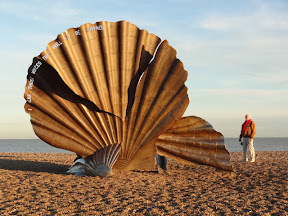 On Aldeburgh beach I was intrigued by this massive metal sculpture of a giant scallop. 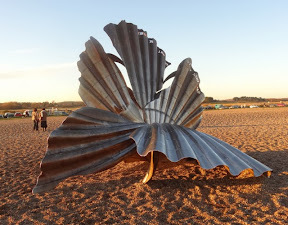 It's by Maggi Hambling, the renowned sculptor and painter, and apparently caused major controversy in Aldeburgh, because some people thought it destroyed the tranquility of the beach. Some of the local inhabitants threw paint over it. Personally I think it adds to the ambiance. Here's a picture I took of the other side of the edifice. 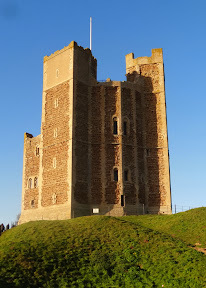 We like visiting castles and such like and luckily Orford Castle was open over the Christmas season so we found our way there on Saturday afternoon. The castle was built during the long reign of King Henry II. Though a most formidable ruler he suffered endless adversities - from his rebellious barons, his troublesome family, and his one-time friend, Thomas Becket. 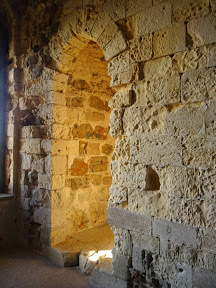 Orford Castle was built in response to some of these difficulties. Although the main walls and gateways are no longer standing, the keep (above) survives to its full height. 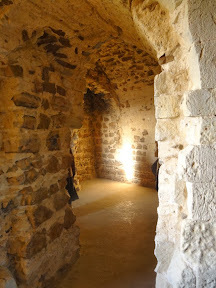 In fact it is the earliest English castle with surviving building. We spent a very pleasant hour or so climbing up inside it. Here are some of the alcoves which lead off to chambers once used by important visitors. 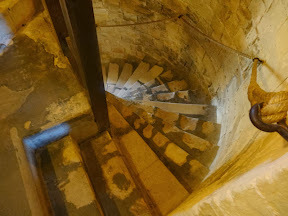 And these are some of the vertiginous stone steps we climbed. Luckily there were ropes to cling on to as we moved around the castle keep. 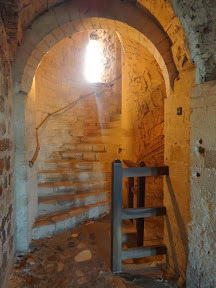 Part way up is a little museum containing a variety of artefacts relating to the castle and surrounding countryside. 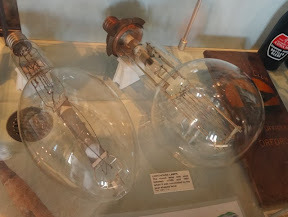 Here are a couple of electric light bulbs which once resided in the nearby lighthouse. I wonder what sort they'd have to use now with the current European regulations. 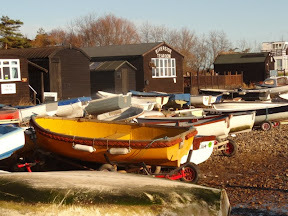 And here is the quay at Orford. 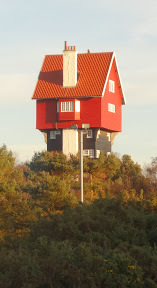 In a very pretty little town called Thorpeness in Suffolk we saw a house that seemed to be perched on a windmill. They call it 'The house in the clouds' and is available for rent. At a price! 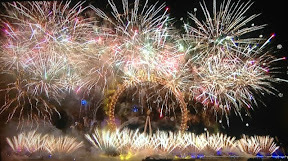 The year ended sadly with funerals of two of my friends - one held yesterday at St Nicholas Church. 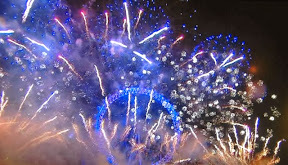 But now it's a new year and to start it have a look at some of the views of the London New Year firework display.